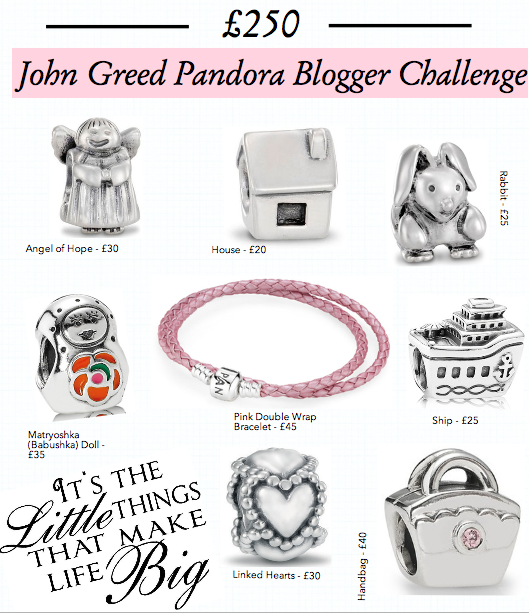 I have seen a few entries to the John Greed Pandora Blogger Challenge floating around the Twitter and Bloggersphere of late, and I fancied my chances at creating myself a perfect bracelet! All you have to do is create a blog post detailing your ideal bracelet up to the sum of £250 (mine hit £250 spot on!) and send them a link to your blog post by the 5th of December. I am entirely new to the idea of Pandora. The closest I have come to their adorable charms and elegant bracelets is through pouring over them longingly in the glass of the windows and cabinets of the jewellers. I think the whole concept of Pandora is beautiful. I love that each is charm chosen for someone special, for it to mean something and be entirely reflective of them and their personality. I have chosen the charms above based on my life and things that I love - so what do they mean for me? I am a big believer in hope. I honestly feel so downtrodden when I see people despairing and have given up all hope. You can always hold on to hope and dreams. As the last thing left in Pandora's box there's a real significance in looking towards the future in any situation and hoping that something will always come out of nothing and that good times can overshadow the bad. One of the careers I am considering with my Criminology degree is to go into the probation service, I want to share with people that you can always hope for something more. Anyone that knows me will have heard me say that before I have any children I want to become a Mummy to a gorgeous little bunny rabbit, one that I've adopted from a shelter and taken in so he can live out the rest of his days in pure rabbity luxury and forget about why he was put up for adoption in the first place. I think they're so adorable and cuddly! I couldn't by pass the 'fashion' category on the John Greed website and not include a handbag. I'm such a bag lady, honestly I get so excited even when a shop hands you your purchases in a lovely paper bag and string handle carrier. I have more bags than you can shake a stick at, and I couldn't say no to one more, could I? I adore the little gemstone too, best colour in the world! This charm is for my younger brother (who's not so little anymore considering he'll be turning 20 soon!) He's away at university and while we may have the odd tiff at home we'll always be there to love and support each other. He's always my go to tech person, and the first person I'd call in a crisis because he's so level headed! Even though we may never live together at home ever again, we'll always be linked by out sibling bond and these hearts are a lovely representation of that. I have chosen the Russian Doll Charm to represent my dearest Mummy. When I was 6 we moved to live in Moscow, Russia for a few years with my Dad's job. I distinctly remember walking around the markets and finding the Russian dolls that all sit inside each other, and she bought a few sets (some of which still sit in the living room!). Little trinkets like that linked to moments I'll never forget invoke such happy memories. The colourful pattern on the doll's tummy is also relevant, especially as my Mum makes and decorates her own stained glass and the colours and shapes remind me of that! Are you a fan of Pandora bracelets? Which charms are your favourite that you would put on you bracelet? I love the pink bracelet, it's a bit different from the normal chain! My favourite charm is the angel, so cute! Thank-you so much :-) I would really love to win, I just can't believe I'm never been properly introduced to Pandora before! I Had My First Ever Lush Bath...and It Was Lush!